A Pen And A Path: Writing As A Spiritual Practice (An Explorefaith.Org Book) ReviewSarah Stockton's A Pen and a Path: Writing as a Spiritual Practice provides a wealth of material for individual journal writers and for groups. The author's five-step exercises gently invite readers to explore their personal spirituality at deeper levels than other personal writing books that I've read do. This significant book will become a well-loved writing classic. 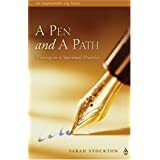 Want to learn more information about A Pen And A Path: Writing As A Spiritual Practice (An Explorefaith.Org Book)?